The CIA gets approval to attack a wider range of suspected militants, even those whose identity is not known. (WIRED ) -- Once upon a time, the CIA had to know a militant's name before putting him up for a robotic targeted killing. Now, if the guy acts like a guerrilla, it's enough to call in a drone strike. It's another sign of that a once-limited, once-covert program to off senior terrorist leaders has morphed into a full-scale -- if undeclared -- war in Pakistan. And in a war, you don't need to know the name of someone on the other side before you take a shot. Across the border, in Afghanistan, the rules for launching an airstrike have become tighter than a balled fist. Dropping a bomb from above is now a tactic of last resort; even when U.S. troops are under fire, commanders are reluctant to authorize air strikes. In Pakistan, however, the opposite has happened. Starting in the latter days of the Bush administration, and accelerating under the Obama presidency, drone pilots have become more and more free to launch their weapons. "You've had an expanded target set for [some] time now and, given the danger these groups pose and their relative inaccessibility, these kinds of strikes -- precise and effective -- have become almost like the cannon fire of this war. They're no longer extraordinary or even unusual," one American official tells CNN. This official -- like many other officials -- insists that the drone strikes have torn up the ranks of militants. "The enemy has lost not just operational leaders and facilitators -- people whose names we know -- but formations of fighters and other terrorists," the official tells the Los Angeles Times. "We might not always have their names, but ... these are people whose actions over time have made it obvious that they are a threat." 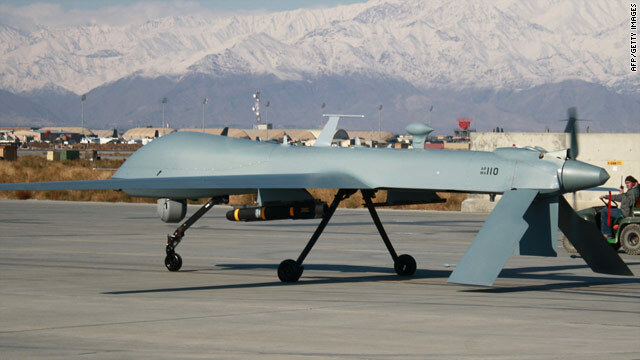 National security law experts, inside the government and out, are in the middle of an intense debate over whether the remotely piloted attacks are legal. One leading law professor told Congress last week that the drone operators could be tried for "war crimes," under certain circumstances. The State Department's top lawyer counters that the drone attacks are a legitimate act of self-defense. The connection between the robotic strikes over there and our safety here appears to be growing, The Pakistani Taliban, who have claimed credit for the botched Times Square bombing, say the car bomb was in retaliation for drone strikes. But the robotic aircraft are only one component in the war in Pakistan. American troops are on the ground there, and getting into firefights. American contractors are operating a fleet of helicopters above. Higher in the sky are the American drones, flown by the U.S. Air Force and the CIA.